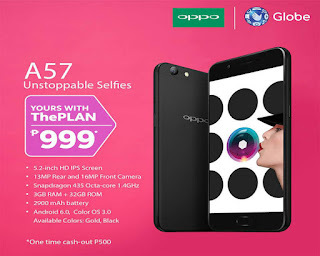 You can now own an Oppo A57 at very affordable monthly basis payment when you apply for Globe postpaid ThePlan 999. If you’re excited to get a new smartphone and don’t want to pay the whole price, get it via postpaid plus you can enjoy the added network services like call, text and data monthly with your subscription. The Oppo A57 features 5.2 inch HD display with 3GB of RAM powered by an Octa-Core processor. The device is running on Color OS 3.0 based on Android 6.0 Marshmallow operating system that features UI optimization, efficiency and speed. You can take unlimited selfies with its 16-megapixels front facing camera and take good quality photos using the 13MP rear shooter. Here’s what you can get when your plan application gets approved by Globe. There's one-time cash out of 500 pesos. You can visit your nearest Globe Store to apply for this plan or call their hotline for queries and more details.